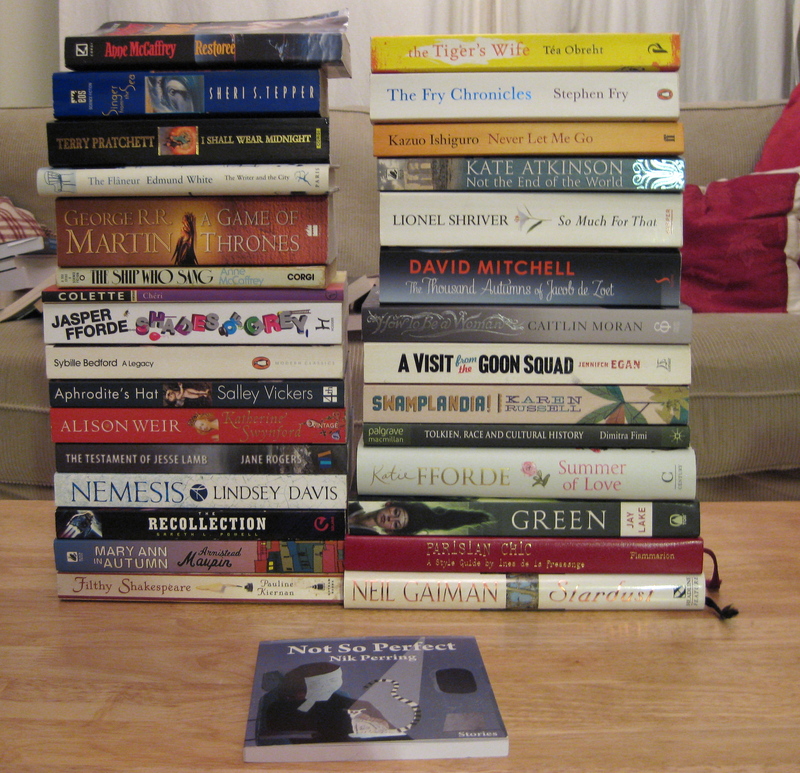 Here’s a sort of review of my year in books, in reverse order. 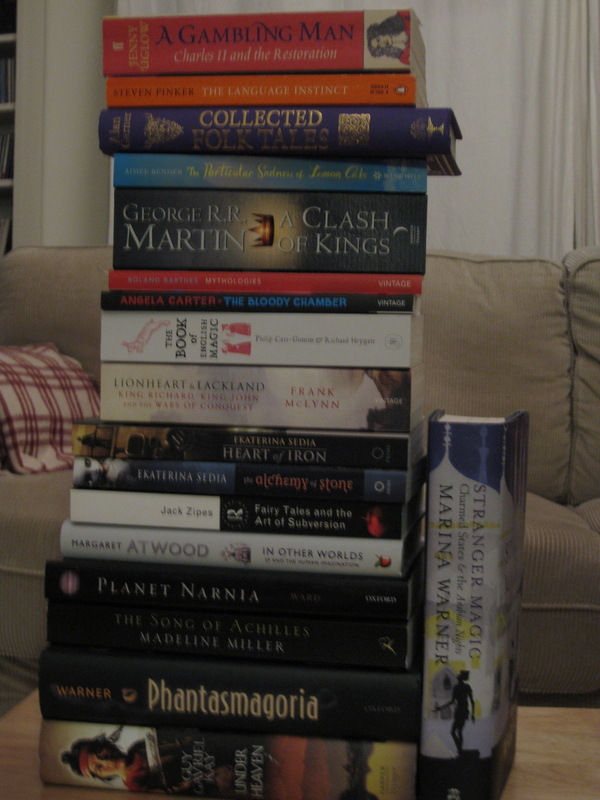 And lastly – and quite satisfying it is too – the books I have read, or reread this year. Not included in this picture are Jane Shilling’s The Stranger In The Mirror, because I’ve loaned it to someone, the first four Harry Potter books (I’m working through them with my daughter), or The Hobbit, which I’ve read to my daughter at least twice this year. It’s one of those days, a good day that feels ever so slightly at an angle to so called ‘normal’ days. Real things feel more real somehow, and unreal things feel slightly surreal. Superman walked down the High Street, his muscle suit bulging, although the cape action was hampered by the insufficient breeze. All the people sitting outside Costa stopped talking to watch him as he passed. You see? One of those days. So. April has been, and gone; the appleblossom is done with, the lilac is almost over. I had bunches of it scenting the whole house for days; heavenly! There are still some Easter eggs yet to be consumed; we’re working our way through those… and my daughter has at last gone back to school – she had a very long Easter holiday, which explains why my self-imposed deadline has been missed. Yes, the WIP is still in its formative first draft stage. BUT there are only three chapters left to write, including the one I’m writing at the moment. ALSO, I have had several moments of clarity, epiphanies if you will, those bolts of open-jawed whydidn’tIseethatbefore inspiration so invaluable to seat-of-the-pants plotters like me. So not only do I now know how it will end, but also when it will end. And I have an additional plot device to enrich the narrative detail with when it comes to the Second Draft. So you have before you a basically happy neophyte novelist. There have been other matters that have contributed to the curtailment of writerly effort, family matters on a par with the Life stuff that scuppered writing last July. But these are now mercifully in abeyance, and that’s all that needs to be said about that. And while I’ve been writing this I have come upon a happy secret – somebody let something slip – but it isn’t mine to tell, and I promised to be discreet, but it is a truly happy secret, and just goes to show that today really is one of those days. While I haven’t been writing, I have been reading; Lionel Shriver’s So Much For That, and now David Mitchell’s The Thousand Autumns of Jacob de Zoet. If you’re looking for something new to read you could do a great deal worse than to pick up either of these titles. Both are tremendously good writers, and I have loved and am loving reading them. And that’s all I’ll say about that. Summer is rushing upon us for lack of rain and a surfeit of sunshine. And next weekend we’re off to glorious Devon again. Life is good. Once upon a time, I was able to do it all. Once upon a time, I didn’t need as much sleep. Now I find myself pulled in so many directions – too many directions. I can’t do it all. Last night for instance; I got into a good flow of writing, and I would dearly have loved to have just carried on. But no. I had to be up very early again this morning (Very Early), so I had to give in to my body’s unreasonable need for sleep. Once upon a time, I could race through my reading list, gallop and cavort through several volumes at a time. Now, I have to juggle my reading time with writing, and sleeping (never mind everything else, the non-negotiables that come with being a mother and a wife). Maybe it’s an age thing; that has a ring of inevitability about it. I can no longer burn the candle at both ends; not if I want to be taken seriously as a decent-looking, well behaved human being. Zombiedom does not appeal! But the main reason my brain has wandered down this particular path is the issue of reading. I’m still ploughing through – and digesting – The Seven Basic Plots (Booker, 2005), and I’m still dipping into and loving The Legacy (Bedford, 2005). 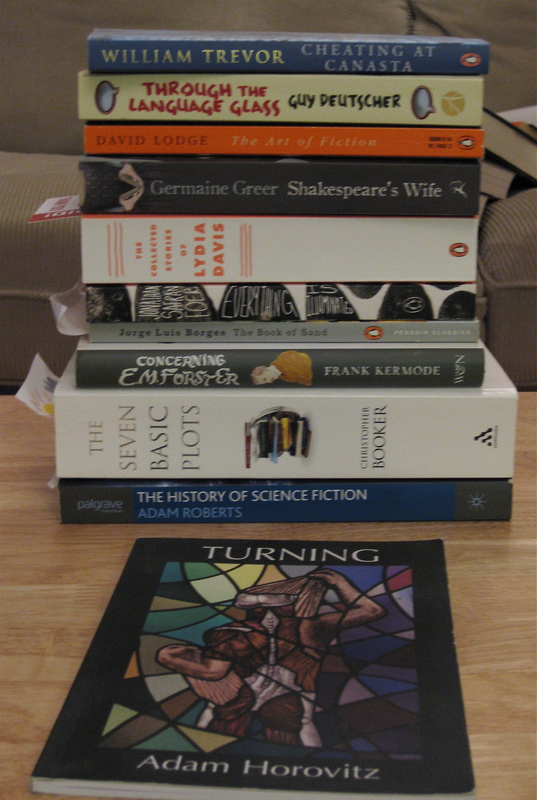 But the waiting to be consumed pile never seems to go down, and already I have more to add to it. Under Heaven (Kay, 2010) is the hardback treat I have promised to myself for when the First Draft is completed – so a sort of non-chocolate easter egg. Then there are two new paperbacks, The Thousand Autumns of Jacob de Zoet (Mitchell, 2011), and So Much For That (Shriver, 2011). I won’t go on, because if I do, I won’t know where to stop; working in a bookshop is a tremendous source of pleasure, but also frustration! And if I had a penny for every customer who has looked round at the laden shelves and told me that they suppose I spend all my time reading… I gave up trying to read at work when Cold Mountain was published, back in 1997. There are only so many times I can cope with rereading the same page and then being interrupted. I’m not there to read, but to assist, to sort out, to make presentable. The shop can be quieter than a really quiet thing, and I promise you, the moment I think about picking up a book, someone will ask me something. I never did finish Cold Mountain, either… so many books, and not enough hours in the day. But the sun shines more and more, with increasing strength. I’ve seen celandines, little golden glossy stars that twinkle in the verge. And the washing line once more billows with laundry, while the apple tree promises to unfurl its blossom in a few more weeks. Spring is bouncing around like a bouncy thing in spring, and the WIP is gathering pace. So I’m not complaining, not really.